In response to the rising challenges facing data centre operators, owners, systems designers, equipment manufacturers and customers the European Commission have introduced the Code of Conduct for Energy Efficiency in Data Centres. The Code aims to raise awareness of the issues and opportunities and to recommend best practice solutions. We introduces the Code, the benefits it brings, the levels of commitment required, the technical background to the best practices, data collection and reporting together with real examples. 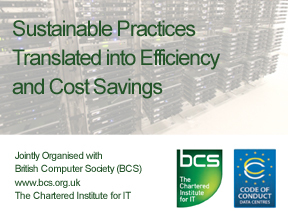 This 2-day training seminar enables individuals working in data centres to improve cost and energy efficiency. The ongoing development of the Code encompasses topics associated with new data centre planning and development, and the tuning and operation of existing facilities. Service providers and equipment manufacturers will take a particular interest as the Code takes into account the full range of technologies used in the data centre environment and its impact in how procurement decisions are made. The whole syllabus and examination are accredited by British Computer Socity (BCS, www.bcs.org.uk) which contributes to Intermediate Certificate in EU Code of Conduct on Data Centres. IT, Project and Facilities Managers, Designers, Consultants, etc. who are responsible for highly critical systems, like the UPS and CRAC systems, etc., in Data Centre and IT equipments are suitable to attend. contact us at (852) 2117 3893. All courseware, training materials and completion / CPD certificate have been included. All technical events are conducted by experienced Chartered Engineers (CEng) who have more than 10 years experience in Data Centre Design & Build, Energy Conservation and management in the private and public sectors.